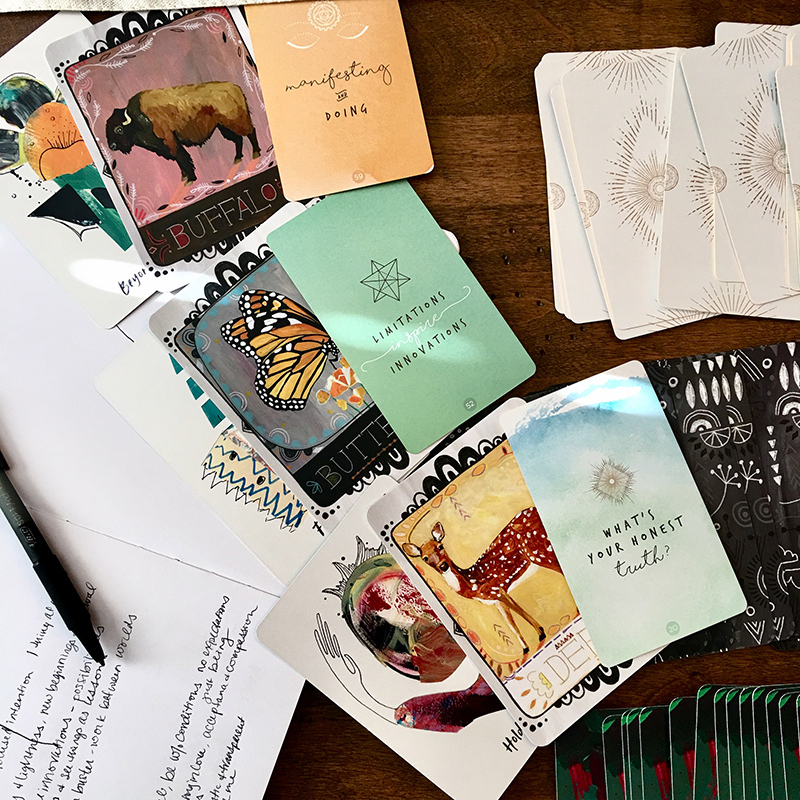 My favorite way to start planning for the new year is to pull cards for the year and then for individual months. This year I pulled from three different decks. Each deck has a different feel, different messages and speak to different aspects of life. My deck (green and pink abstract) are a lot of hopeful messages and some things to be aware of or change. The white and gold deck are geared for creatives and entrepreneurs. The animal deck is more like an energy or awareness to work with as an animal symbol. I started by protecting myself with a white light and asking my guides to help me see, know and understand the messages. I don’t know if there is a right or wrong way but it helps me feel centered, calm my thoughts and be open. Plus I like the idea that there is someone out there helping me and protecting me. To each their own though, I don’t claim to have it right but since I’m about following what feels right for me this is how I do it. I pulled a card with the idea that it would be a message for the whole year. One card for different areas of focus: message, guide and work. A message to be open to for the year or month. A guide that I can call on for support and hear their guidance. The work that I need to get through to improve and achieve my goals. I then take a moment to try to use my own intuition to understand how they all work together and what they are telling me. 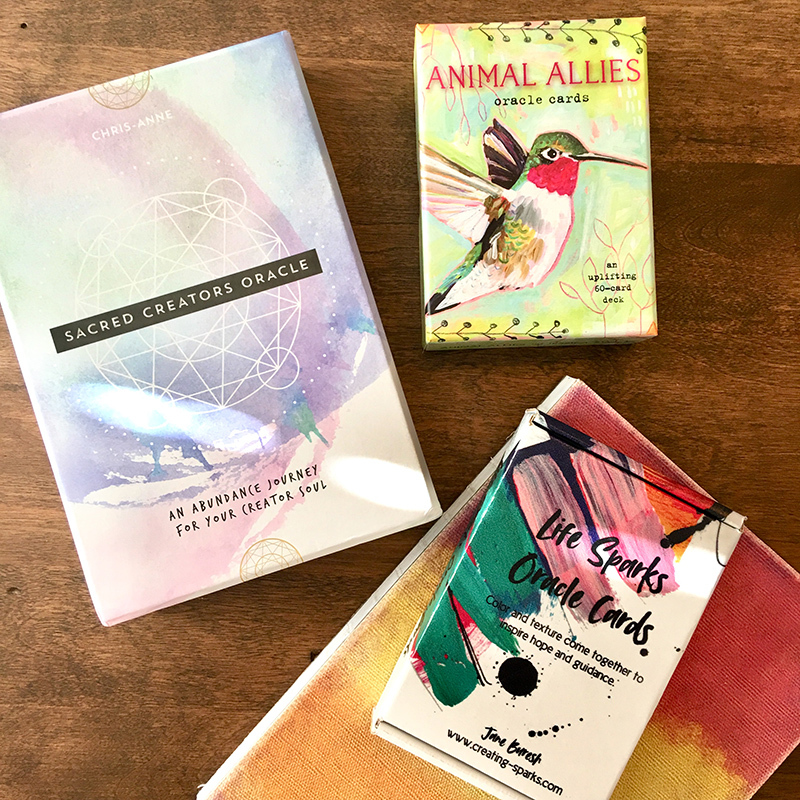 After I tune into myself and what I got from the cards then I use the guide books to see what else is there for me to explore. I take notes that I can return to throughout the year as well. I like this tradition I’ve started because it gives me a sense of support. I like goal setting and dreaming big at the beginning of each new year but I can quickly feel lost and alone. With the cards it is like getting a little quiet support from the universe. The cards seem to speak directly to what I’m dreaming of and what I know (sometimes don’t know consciously) I need to work on to actually get there. The oracle cards are not my future laid out in stone, they are a guide and a nudge. They give me a little light down a path that I can try on. If I change my mind they are still there to guide me down a new path. I love to adventure into new territory and down back roads but I love a little signage along the way so I know I’m not totally alone. What I’ve learned over the years is that the signs and my own intuition are quietly waiting for me to look and need them. They are subtle and sometimes hidden so that I have to really be open, quiet and looking to see them. My cards this year fit very nicely with my goals for the year and with the numerology of the year and my personal year number. I am not an expert or even novice with numerology but I find it interesting to follow along with some great people that do this for a living. My guide for the year is snake. At first I’m bummed because I’m not really into snakes but the message and energy is about transition and revealing a new self. This idea I can get into as I want a change in my business and how I show up in all things. My message card is Protect Your Dreams and it isn’t about hiding so much as it is about believing in them and protecting my time and energy needed for these dreams. The work I need to do to get to my goals is to fearlessly express my ideas, my vision and my mission. I’ve been hiding the last few years, just barely testing the waters, afraid to really be seen and judged. These are my cards…. What are yours?! I usually pull one card for each month for the whole year. This year I decided to just do it quarterly especially since I was using so many for each month. As I started thinking about it the more sense it made to do it this way because we all effect our own future with our choices, our thoughts and our emotions. What I am feeling and thinking and being (energetically) can change and therefore so can my cards. Seems best to come back not only for more accuracy but for a renewed sense of connection to guidance. Tell me…. what do you like to do to feel connected, guided and ready to work on your dreams?